Porter was an outstanding figure in Trump's circle. He was in charge of coordinating the documents that arrive at the presidential desk. Sponsored by Kelly, he had gained prominence. For example, he helped write the State of the Union address delivered by Trump in Congress, last week. And I was traveling with the president. The personal secretary had, apparently, an unblemished record. He studied at the universities of Harvard and Oxford, worked for three Republican senators and is the Roger Porter´son, who was the economic adviser to President George H.W. Porter was one of the 22 most senior advisers in the White House, with a salary that amounted to $ 179,000 per year. One of Donald Trump's well-known advisers, Rob Porter, has become a problem for the White House. 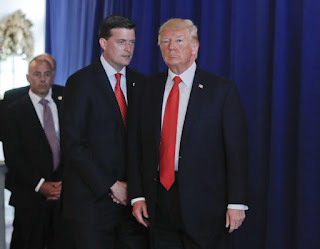 Porter announced his resignation as secretary of staff of the US president on Wednesday, after his two ex-wifes accused him of physical and verbal abuse against them. As expected, he denies them. The resignation was not going to materialize until a substitute was found, but on Thursday, the White House reported that Porter was leaving his position and I gave up working with them. A little less than a day and a new crisis had unfolded in the Trump environment. In this case, the controversy revolves around whether the White House was concealing an alleged abuser and whether the president and his environment knew the accusations when Porter was appointed to the position a year ago. The two ex-spouses claim to have communicated to the FBI the alleged abuses of Porter at the time the police agency was investigating his background to grant him a security credential as a senior government official, in January 2017. It is not known if the FBI transmitted that information to the presidency. However, the White House admitted, this Thursday, that Porter had a temporary security credential and that he had not finished the FBI's investigation into his background, yet. Trump valued the case for the first time, this Friday. In a statement to the press, he described the alleged abuse as “sad” and “surprising” and explained that he had recently heard the accusations. He also asked to remember that Porter, who praised his work in the White House and wished him a successful career, is innocent. Raj Shah, deputy spokesman for the White House, acknowledged on Thursday that the case may have had a different treatment, but tried to contain it. To his way of seeing, the denunciations of domestic violence are serious and disturbing; and assured that Trump and his chief of staff, John Kelly, did not know the full nature of the allegations until Wednesday. The scandal questions this version and leaves Kelly, who defended Porter after the British newspaper The Daily Mail unveiled the scandal when talking with the two ex-spouses. Kelly did not rectify until Porter announced his resignation. Then, it issued a statement where it is declared impacted. To further complicate the case, Porter maintains a sentimental relationship with Hope Hicks, the communication director of the White House. On Tuesday, Hicks' position in the writing of Kelly's statement defending the integrity and honor of the personal secretary.